“This is the future. 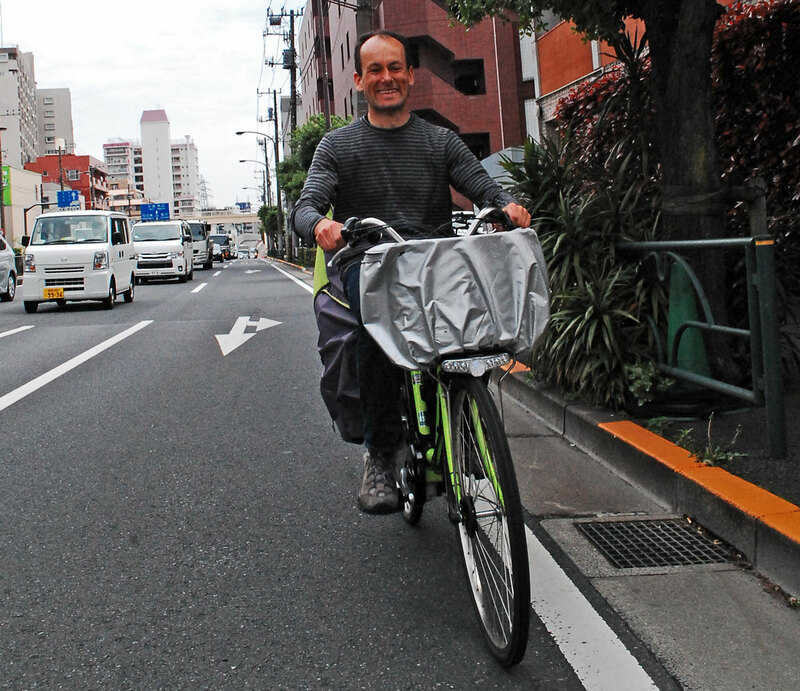 It will change everything!” said Koichiro Nakamura as he pointed to a bright green women’s bike in front of his office. We had met to discuss cycling and the media in Japan… and this bike wasn’t what I expected. After I got over my initial surprise, I remembered riding through Tokyo last year on the way to TOEI, the great constructeurs of classic cyclotouring bikes. As we approached a narrow underpass, a woman on a similar city bike passed us and cut in front of Hahn in a maneuver that would not have been out of place in a cyclocross race. She took the “holeshot” and accelerated away. Nothing about her bike or her appearance suggested a competitive nature… but she had an electric motor that greatly enhanced her power output. Then we saw them everywhere. 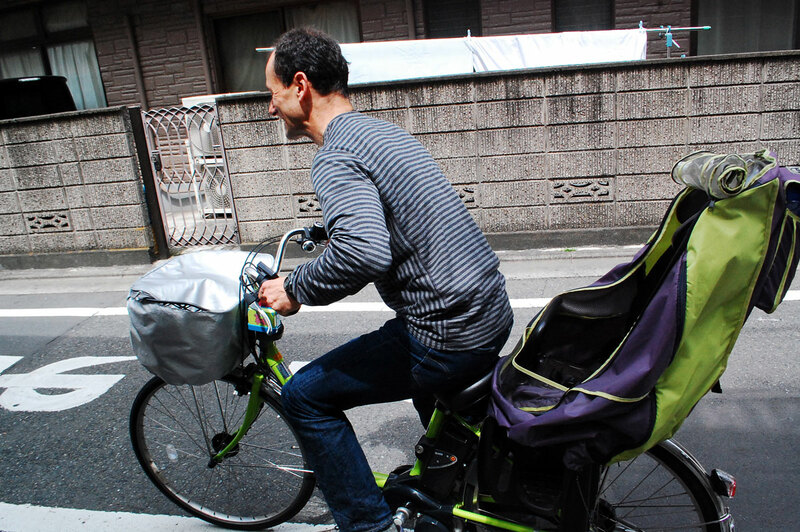 Women (mostly, Japan still being a society with somewhat rigid gender roles, at least on the surface) who carried not just one, but often two children on seats attached on the front and back of their bikes. Mothers and children were well-dressed as Tokyoites tend to do and most definitely not working up a sweat, yet moving at a rather brisk pace. “Do you want to try it?” Koichiro interrupted my reminiscences. Of course I did. The bike belonged to Kaori Inoue, who shares Koichiro’s office space. She was happy to loan her bike and show us its special features. She was especially fond of the kick-stand, which also locked the headset. With the kickstand down, the headset indexed. You could still turn the handlebars against the ratcheting indexing, but they would not turn on their own. This greatly facilitated loading the bike. The kickstand itself was a huge centerstand that kept the bike upright, again to facilitate loading. The last thing you want is your bike falling over with your child on board as you load the basket in the front. There also was a sophisticated child seat with integrated rain cover. These bikes may not be intended for enthusiasts, but they are quite sophisticated. And so I got to ride an e-bike around Tokyo for a few hours! I was surprised how efficiently I could move with traffic. I especially liked the boost when accelerating from a light. Stopping no longer was an energy-sapper like it is on a normal bike. I realized that e-bikes allow non-cyclists to use bikes efficiently. What would be a real workout even for a fit cyclist becomes more akin to a stroll with an e-bike. You still get some exercise, you still pollute much less, and you should have fewer problems parking at your destination. It’s a win-win-win situation. No wonder these bikes are so popular! 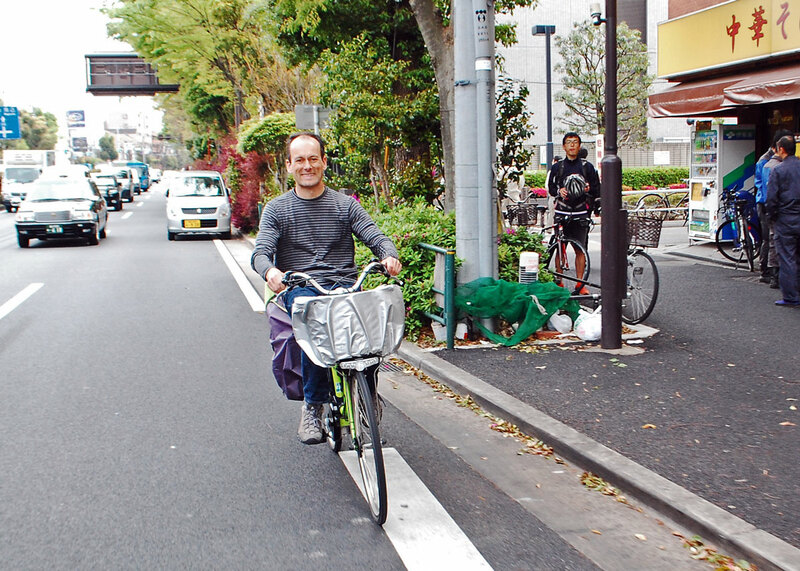 Then Koichiro told me that Japanese urban cyclists recently have won the right to ride in the streets, after having been banished to the sidewalks for decades. He was very proud of this fact. I wonder how much e-bikes contributed, because they really are too fast to ride on the sidewalk. Then it dawned on me: E-bikes democratize speed. Anybody now can ride at speeds that before could be attained only by well-trained cyclists on performance bikes. That made me think that our infrastructure planners still are designing facilities for the last century. Most of the trendy cyclepaths are suitable for speeds of up to 15 km/h (9 mph), yet modern e-bikes go much faster. As your speed increases, the fear of getting hit from behind is reduced, whereas the dangers at intersections increase. With e-bikes, we’ll soon have a new constituency who will demand a cycling infrastructure that can be used at reasonable speeds, which allows commuters to cover significant distances efficiently. It’s a constituency that cannot be so easily dismissed as “fast and fearless” (although that Tokyo lady who cut off Hahn might qualify), but one that has to be taken seriously. Already, there is talk about re-designing bicycle facilities in the Netherlands to make them suitable for e-bikes. For avid cyclists, re-designing bicycle facilities to accommodate higher speeds and greater distances can only be a good thing. Let’s hope that North American urban planners don’t ignore this trend and spend countless millions on more infrastructure that soon will be unsafe and outdated. As a bike shop owner I can almost hear the screams of my customers as I inform them that their chrome-plated cheapie wheels are toast and that a new hub is unobtainable because this manufacturer does not stock parts and taking off that complicated rear-wheel/drive assembly is going to be around 200 bucks not including a tube. That’s where the Bosch drive unit takes the lead with e-bikes. Bottom bracket drive unit which uses a standard rear wheel without additional bits. 20mph cutoff with a 6ms response time. The electronics monitor input torque 1000 times per second to keep an even power output to match the rider input. I won’t push any one particular brand using it, but our shop now carries e models from one of our regular brands, and they’re quite amazing to ride. I like to ride for exercise, so it would defeat my needs, but we’ve built a couple of them up for commuters and couriers. mid-drive units take the place of needing to replace a wheel. there are retrofit mid-drives like Bafang that can easily convert a regular bike into a e-assist bike. if you’re buying a new purpose built bike, Bosch, izip, and Shimano are offering mid drive motors that require a special frame. the Bosch and Shimano motors offer different sensory for better motor assistance then the current gen Bafang, however, none of these mid-drive motors are interchangeable (a purpose built Bosch frame can’t use a Shimano motor). I have come across a few ebikes while I have been in my auto and on my traditional bike. It was somewhat disconcerting because I didn’t judge their speed properly. As a result, I may have made a right hand turn in front of the ebike instead of letting the ebike go ahead. I have a replaceable front hub e-motor I put on my rando/porteur sometimes, which creates a natural A/B test, and I noticed the same thing when I have my motor hooked up. It seems drivers use cyclcists’ effort as part of judging their speed? I was reading that there were about 400,000 e-bike sales in Germany last year and they currently make up about 1 in 10 of all bike sales there, however sales are mainly to the “older generation”. They are still quite pricey compared to a good conventional bike although prices will surely come down with volume. They are still cheaper than running a car or public transport in a lot of places. I’d agree with you about the need for suitable infrastructure. If people won’t use a conventional bike because of perceived safety concerns from mixing in close proximity with motor traffic, they aren’t likely to use an e-bike either but any separated infrastructure needs to be adequate for the speed and volume. I don’t envy traffic engineers as infrastructure adequate for 2% bike modal share may not be adequate for, say, 15%, but it would be tough to justify without evidence of demand… but that would be a good problem to have. 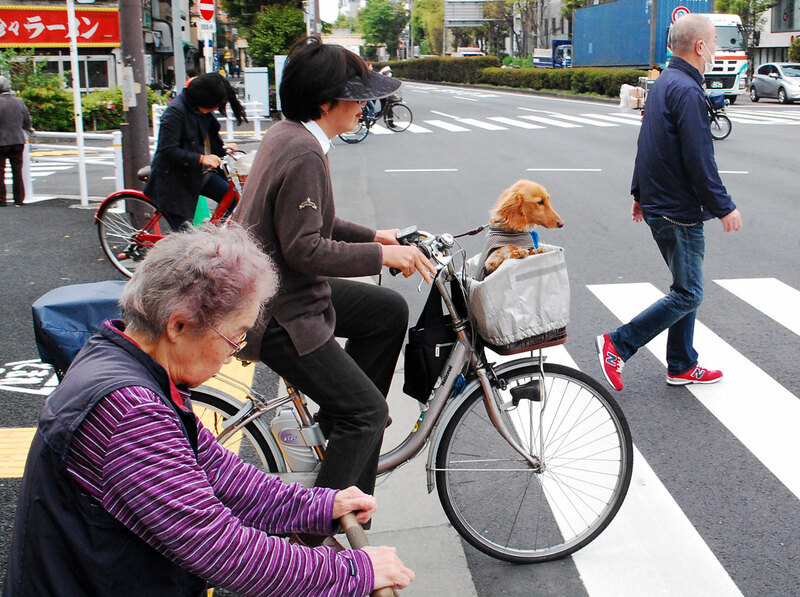 In Tokyo, it seemed that people on e-bikes were less concerned about “mixing in close proximity with motor traffic”, probably because the speed difference is so much smaller. It’s a simple truth: The faster you go, the easier it is to feel comfortable as part of the general traffic. I am convinced that ebikes can be a big part of the urban transport matrix. I bet they will be totally reliable (electrical motors being simpler than internal combustion), economical relative to cars, and easier for the less committed than bicycles. In a city like Seattle (moderate climate, enough hills to dissuade the casual would be cyclist, expensive parking) they are a no brainer. In most of the U.S., electric-assist bikes are limited to 20 mph, but that’s at the high end of design speeds for most bicycle infrastructure. That makes electric-assist bikes technically illegal on facilities like the Burke-Gilman, the I-90 Trail, etc., and it’s not clear whether they’re legal on cycletracks — it depends on whether the facility is legally a bike lane or a separate path, and cycletracks’ legal status is undefined in state law and city code. But e-assist has huge benefits for riders who can’t handle hills or distances entirely on their own power, so there has to be some better approach than a ban. Obviously I’d prefer upgraded infrastructure with a 20 mph minimum design speed for bicycles, but that would cost a lot of money. Effectively outlawing e-bikes cannot be the solution – if you cannot use cycling infrastructure, e-bikes don’t make much sense, at least in Seattle, where the best ways around include a mix of streets and trails. Fortunately, that ban doesn’t appear to be enforced, since I see e-bikes on various trails around Seattle. They aren’t going much faster than a fit cyclist, so it seems silly to outlaw them. Yeah, the illegality on the Burke seems to be from King County, not the state. Regardless, enforcement seems to be extraordinarily light (or nonexistant). “upgrading the infrastructure” is sort of a red herring. there has been no basis for design for bicycle facilities as far as I can tell. Where roadway design has been based on some statistical test completed in the 1950s, bicycle facilities design has been done basically by planners without much focus on statistical analysis. for instance, there really isn’t a standard for stopping sight distance as it applies to bicycles. I don’t see us needing to upgrade infrastructure for e-assist bicycles. We will probably do more things like laws about their use in existing infrastructure. There seem to be lots of people who like the idea of cycling. As cars become less important as status symbols, replacing a second car with an e-bike becomes an interesting option. I love them until I have to repair them. Jan, I think you nailed the issue: incorrectly designed speeds for bike facilities. I had always resented the intrusion of e-bikes on separate bike facilities, in much the same way I resented the intrusion of peds on the same facilities – just more stuff to dodge. Although e-bikes are supposedly built to travel at no more than 20 mph (32 kmh), it is not difficult to soup them up. The e-bike we use at the Burnaby indoor velodrome can tow us at 70 kmh in motorpaced workouts. So increasingly I am being passed at speeds well above 30 kmh by the same a-holes with something to prove who try to buzz by on conventional bikes at 40 kmh (before they drop off to 32 kmh again). But as you say, the problem is not the e-bikes; the problem is with the shortsighted facilities with too-narrow paths and nonexistent sightlines designed by so-called traffic engineers who know squat about the bicycle performance envelope. I have no problem being passed by e-bikes on painted bike lanes on arterials. But it is too easy to outperform the design specs of most “bicycle infrastructure” on a modern e-bike. The best solution would be to relegate e-bikes to the same streets as cars, but reduce the speed limit to 20 mph on those city streets. The additional benefit would be that you would reduce the traffic fatality rate on those streets to close to zero. Great to hear cycle roads are on the list of being adapted to higher speed cycling! But to ride an e-bike myself doesn’t feel comfortable either, because supporting limits are set at 25 km/hr (at least in Holland they are) and I like to ride faster whenever possible. Because of the high weight of e-bikes it would be more strenuous to ride such a bike without support from the motor at speeds above this limit. But well, I guess I’ll have to get used to this, since I don’t think e-bikes will disappear from the roads any more. E-bikes are interesting, because they make it easy to ride at moderate speeds, but when you try to go faster, the motor assist decreases, so you just put out more effort without any extra speed. So it’s not much fun for an avid cyclist, who is used to getting a reward in speed for extra effort. Ps: You should test THAT BIKE!!! What a dream that thing is!!! The Japanese restrictions on electric-assist bikes (the type most popular here) are similar to your bikes in the Netherlands then: electric assistance is only active while pedaling and progressively decreases with speed until it drops to 0 W at 25 km/h. Any bike that doesn’t fit within that envelope is treated like a moped (原付き, 50 cc motorbike) in Japan, which means a license plate, mandatory insurance, rider has to wear a helmet, no riding against one way streets (which usually have explicit bicycle exemptions here), etc. I don’t understand the frustration with being passed by someone on an e bike. It’s not a race unless you pin a number on. If e bikes get more people out of cars I am all for them. You can’t keep motors off a bike path very well–I have been passed by a motorcycle, not moped, not e-bike, on the I-205 path near Portland. I’d keep the laws on ebikes as slack as possible to encourage their use; hope that more ebikes replace cars than replace pedalled bicycles. I think people who love to ride aren’t interested in e-bikes, so I don’t see e-bikes replacing standard bikes, at least in use. They may replace standard bikes that currently stand unused in the garage, but that is OK. I don’t know if that will necessarily be the case. I think we might be better off thinking of e-bikes as potential car replacements, rather than as an alternative bike to own. For example, several folks in the DC area, myself included, are avid cyclists that have built or purchased e-bikes as car replacements. And we still have our other bikes for recreational rides or other trips that don’t require high cargo capacity and/or lower exertion levels. That’s a pretty broad statement and there would have been at time when I agreed with you. I also considered it “cheating” to use an e-bike. I’ve been nearly car-free for some years. I have a randonneur bike and a folding bike. About a year and a half ago I modified my old commuter bike by adding a Xtracycle extension called a Free Radical. You reviewed the Surly Big Dummy some years ago and the review was not favorable. To me, I loved it instantly. Sure it didn’t respond like my Randonneur bike, but why should it? Should we expect a Ford F150 truck to handle the same as a Porsche? Of course not. In any case, I saw that a lot of cargo bike owners added an electric assist. I was resistant at first because I could handle moderate hills loaded up with a Costco run without too much trouble. But then I finally talked my wife into hopping on the bike and also pulling a trailer with two dogs. Manageable, but with big headwinds or steeper hills, it was a real struggle. Also, we thought it would be fun to take our dogs to our dog training class on the Xtracycle, but that was up a 25% grade,. which I would struggle with on my own. It is a mid-drive motor that uses a tandem chain ring up to a motor to help power the bike when needed. Unlike the hub-motors you describe, it does respond to my efforts because I am using all of my bicycle’s gears to full efficiency. I cannot just turn on the throttle without peddling. So it works just like a tandem stoker, hence the name. Bottom line, it is lots of fun. I love to ride it. I can use a lot of assistance, or no assistance at all. It’s nice to be able to go anywhere with wife and dogs and not have to worry about being able to fight that headwind, or get up that hill. Mind you, I still commute with a non-powered bike, and I still ride my randonneur bike. My bikes all have their purpose. My stokemonkey equipped bike is my weekend shopper/family hauler. Bottom line, I love riding ALL of my bikes. I am glad the e-Xtracycle is working out so well for you. I agree that on those types of bike, the e-assist makes a lot of sense. Regarding the Big Dummy, we compared it to other cargo bike solutions… Your comparison to Ford F-150 truck is apt. I guess I prefer station wagons that can haul all I need but drive nicer. The Frances Smallhaul had more cargo capacity and was much more spirited in its response to my pedal strokes… but also costs a lot more. E-bikes fail to solve two of the most serious problems limiting the usefulness of bicycles in a transportation mode: they provide no more weather protection than a human powered bicycle; and they are equally vulnerabe to theft. Weather protection: Yes, better fenders would be useful on e-bikes! It took me about 3 minutes to hotwire an abandoned “major brake” e-bike. Ripped the lock core out with a screwdriver, connected the two wires, and I was off. IIRC a lot of e-bikes have removable battery packs, so if you are leaving the bike outside, there is the option to take the battery pack inside to provide another disincentive for a potential thief. Not all E-bikes have keys. Those are just the “off the shelf” bikes. There is a huge segment of the E-Bike world that is more “Do it yourself” and those don’t have keys for the most part. My main worry is the battery. In most cases they are worth upwards of a $1,000, but your point is correct. Thieves really arent’t interested in them. No real black market for E-BIke battries and motors. Now if they ever become accepted on a broader level, that might change. I have locking skewers on my wheels, a short U-Lock and know how to lock it securely. The battery is in a frame bag and could easily be taken, but so far has gone unmolested when I have locked the bike up in front of various stores. I sure hope it stays that way! The e-bikes in Tokyo all have locking batteries… You cannot remove the battery without a key. If you’re not pedaling to carry the weight of it, who cares how much a lock weighs? Facilities to lock to are another matter, however. I love to ride and don’t use/need/want e-assist on 5 of my 6 bicycles. But when it comes to my Xtracycle cargo bike, my Clean Republic Hill Topper (front wheel drive) kit is invaluable for moving the extra weight around Seattle. This is our true car-free future! 10 km/h speed limits are pretty draconian. Maybe they’ll require somebody walk with a red flag ahead of each rider, as they did with cars in Britain during the early years? I’ve been riding around Seattle for the last year on a bike pretty similar to Jan’s “city bike” (for lack of a better term) but optionally equipped with a 250w hub motor. As a relatively young, kinda in shape cycling enthusiast, I think it’s totally awesome, and not just something for democratizing cycling (although it’s that too). Sometimes I’m sore for days after working out too hard (I’m not truly young anymore), sometimes it’s obscenely hot out (ahem… right now), or there’s a get-together or meeting I don’t want to be too sweaty for, or I’m late for… you get the idea. With the motor I still get plenty of exercise on a bike I love to ride, but I can have more control over how much effort I have to put in (e-accelerating after a stop is niiiiice), and I can get there faster and more composed. Also, FYI, my wheel kit is 9lbs, which isn’t going to totally change the way the bike responds to rider inputs over 20mph. There are other things I don’t like about my kit, so the implementation needs work, and my next kit will probably be more like 14lbs (bafang mid drive), but definitely something worth iterating on IMHO. E-bikes may well be game changers. It’s good that an e-bike rider can go faster, with less effort, inducing more riders. It’s not so good that e-bikes can go faster because now we might need some speed limits and real enforcement on cycle tracks. I rather like the Netherlands’ supporting limit of 25 kph (roughly 15 mph). That would put the e-bike in the same range as most enthusiasts, leveling the contrast in speed, and within range of calmed motor traffic at 20 mph. Overall, I like seeing traffic speeds decrease. The big jump in traffic speeds created by motor vehicles were accompanied by a great increase in traffic casualties. Traffic smoothly flowing at or near bicycle speeds is a lot safer, even if it makes the average motorist seethe. What a timely posting for me. I just volunteered to test out some e-bikes for a new bike shop that is opening in Eugene, OR that will sell only e-bikes. I’m supposed to ride two of them until they completely lose their charge next week. I have no idea how long these rides will turn out to be, but I’m assured they will all go more than 50 miles. I fully agree about the current designs of bike infrastructure. It sure would be nice if large enough numbers of people adopted e-bikes (to replace some car miles) that these people became allies in the fight to make the transportation infrastructure work for more people, and faster people, on two wheels. It’s too bad that the manufacturers are limiting the motors to 20 mph. The law in my state, OR, only specifies that the motor alone cannot take a rider over 25 mph; there’s nothing illegal about the motor plus muscles getting a rider up to a faster speed. I suppose if enough people get fed up with the built-in limit then we’ll see some entrepreneurs offering to bypass it for a small fee. It seems to me that 25 mph is plenty fast for a bike that is used on trails and other car-free facilities. Otherwise, they probably should be classified as motorbikes and used exclusively on the streets. Visiting Tokyo often, I have noted the rapid increase of E-bikes the last couple of years, primarily ridden by women. Interestingly I still see very few cyclists on the urban roadways, even where the lanes are available. So few Tokyoites drive cars, that they don’t instinctively “keep left” as we “keep right” in the face of oncoming cycle traffic. This is most often noticed just walking. Even the stairs at the train stations are sometimes marked to “keep left” or “keep right” with arrows on the floor or stair (often ignored). The overall effect of this is a society that seems to wander a lot on the sidewalks, instinctively missing others, and even me when I ride. It used to scare me to not know which way someone would go, causing me to simply stop. Makes for a very inefficient movement of people and bikes, save for their skill. Maybe that’s why they lead the world in consuming anti-depressants? The subways are marked, because whether you walk on the left or the right depends on the city. In some cities, you walk on the left, others on the right. So for out-of-towners, it’s useful… Generally, I found that foot traffic flows very smoothly in Tokyo. Bike traffic is another matter. It almost seems like cyclists decided that, because the government used to ignore cyclists, they could ignore any rules the government put up. So they ride on the right or the left, on the street and on the sidewalk, ignore all traffic signs, etc. Yes, and I think the left vs. right is flexible even in different “Ku’s” or neighborhoods (big as cities). And if a car hits you or your child, you have the right to “punch out” the driver…. They ride anywhere, but I think they obey most signs. I feel very out of place (with good reason) when I employ the “Idaho stop” here. Pedestrians and cyclists will wait for green at even the most insignificant of intersections. We’ve seen a huge increase in the number of ebikes on the road in NL. They are not really being used by people who would otherwise ride regular bikes, rather they are being used by people who wouldn’t ride at all were it not for the ebike. Anything that gets people off the sofa is a good thing. In the Netherlands e bikes have become the main focus of the bicycle business. Just about everyone over the age of 50 or 60 seems to be buying them. Unfortunately they turn out to be pretty dangerous. The number of serious accidents with cyclists over the age of 60 has increased rather badly. The assistence is limited to 25 km, but even that is seriously too fast for the kind of untrained elderly rider that mostly uses them. Many riders simply do not have the balance and control that is needed, or the traffic skills. This is aggravated by a tendency to turn the adjustable handle bar up and pull it back to almost eyebrow level, so they really do not have any control. Many of them ride dangerously on bike lanes, pushing their way between the other slightly slower cyclists. A new kind of 45km e bikes has now also been introduced. From a distance they just look like other bikes, but then they go as fast as mopeds or cars. They really scare me. And yes, we do need better infrastructure. I was afraid that some new riders would exceed their skill level, but that happening even at 25 kph is a little surprising. And 45 kph is just ridiculous for a cycletrack, or urban traffic, really. The opposite of traffic calming. I also think that for lots of elderly people the common 250watt engines are way too powerful and the bikes too heavy. For most eBike users an engine of say 100-150 watt should me more than enough, and why should such a bike weigh more than 15kg? 150 Watts doesn’t get a heavy bike up to any reasonable speed… It seems to make more sense to limit the speed than the power output. On a 5% hill, let’s say the rider puts out 100 Watts, so you have 250 Watts, total. According to Analyticcycling.com your speed (100 kg rider and bike) will be 9 mph. On a 10% hill, that drops to 5.3 mph. Even an enthusiast can love an e-bike. I built one several years ago, using a motorized front hub that I installed on my old touring bike. My commute is very hilly and due to my hectic schedule I was only able to ride my non assisted bike a few times a month. Within the first month of the e bike I’d ridden as much as I had the entire previous summer. I still get a great workout but I can work as hard as I want. Once I get in shape I often choose to ride my non assisted bike. E bikes are great, in my opinion. Jan, congragulation again for this blog.I love that you are happily mixing in some old obscur french compenents like the nivex and the latest ebike boom in Tokyo. This is great! I tend to see myself as a “open minded” personn and willing to try anything before giving my opinion. Well I tried commuting on a ebike lent by a collegue (40k return). The relax and upright position was a first a pleasing contrast with the one I am used on my commuter, but after 30 mins of “cycling” I found it really unconfortable and unpleaseant. This is mostly because you sit on your bottom all the time which is what “new cyclist” like to do on a bike. Maybe that those most sporty model are better but they are also pricier than a velosolex that you can still find for little money in France. I know that solex run on petrol, but with little attention you can keep the consumption below 1,5L/ 100km. They also use pretty common parts and maintenance can be done very easily. Moreover I know that we should put more cyclist on the road but from what I see in France, it looks like those new fearless and overconfident E-cyclist do not seam to have the same awarness of “traditional” cyclist. E-cyclist come from a car culture and I don’t think that they can conform to the etiquette of traditional cycling, making them a danger to us (as it happen with me after beeing overtaken at a dangerous crossroad by a stupid Ecyclist thinking he had the right to overtake since he was “faste”). There is however a need for an alternative to cars in our city, but I strongly suggest that this alternative breaks away from the traditional bicycle image and approaches more the moped image. Several have mentioned the issue of e-bikes allowing people to ride faster than their skills should allow. You have the same problem with all motorized transportation, and on an e-bike, these people are perhaps less dangerous than they are in cars. Also, as they ride more, their skills will improve, I hope – more than in a car, where they are cocooned from the outside world and often oblivious to the “close calls” they have had. As I have become older (?wiser and more tolerant), I now accept them. A decade ago, oh, they aren’t REAL bikes… but hey, if they get more people out of cars, I support them as well. I think you are right, Jan, that e-bikes are game changers. In hot, humid and hilly cities like Nashville, I can’t see another way to get a significant number of people on bikes for commuting and errands, especially during the winter when it is cold and summer when it is hot. My wife and I are elderly (64 and 74) longtime road cyclists, with years of experience touring, riding centuries, etc. A couple of years ago she injured her knee which turned out to be not entirely fixable. It forced her to ride slower and it became difficult for her to do long, hilly rides. As a good husband, I reduced my speed to stay with her and waited for her at the top of the hills. A few months ago we added an electric assist system to her bicycle. The actual amount of assistance (watts) is proportional to the rider’s effort. In other words, if she isn’t pushing on the pedals it doesn’t do anything. The results have been amazing. Now she can ride my speed (and that of our friends) over all terrain. So far we have done 4 – 5 hour hilly rides with as much as 25% battery capacity still left. I estimate my fitness level has increased 20-30%, with no significant increase in mileage. So the benefits have been almost as great for me as for her. I jokingly tell our friends that the e-bike conversion has saved our marriage. Hmmm… you’ve got me thinking about our tandem. We are both 70 and sure could use a boost in the hills. Great story. Helping longtime cyclists get back on two wheels after being sidelined by injury sounds like one of the best consequences of ebikes. Here in New York City, e-bikes seem to be used exclusively by take-out food delivery guys, often seen buzzing down on one way street in the wrong direction with a cigarette dangling from their lips. They ride at 20 mph on sidewalks, ignore all traffic rules, and the police don’t want to be bothered with them since they’re nearly all undocumented aliens and can’t produce ID if stopped. E-bikes are illegal to use on public roadways in NY state, and a bill to change that wound up DOA in the last seesion of the state legislature. It’s been reported in the press that since so many complaints are being lodged at NYPD community outreach meetings, the police have rececently begun a crackdown effort, fining the riders and/or their employers, and even confiscating some. I think Mr. Palincsar raised a couple of insightful limitations, which you immediately dismissed. Maybe to put it in another way, were mopeds game-changers? Or along a similar vein one could ask, why don’t we see the streets of North America full of colectivos and public mini-buses? It would make more sense than individuals driving private automobiles. But you are ignoring the important cultural standing of the car in Western culture. 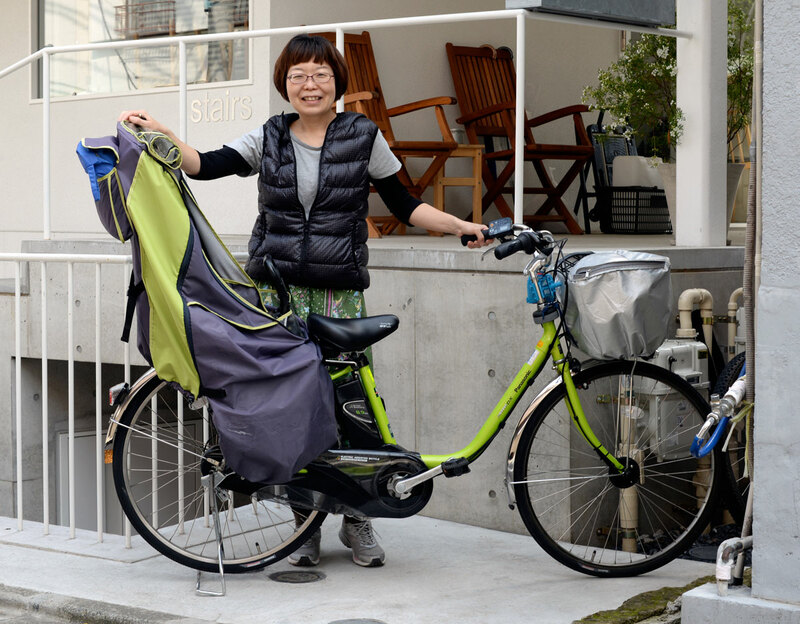 The women who own e-bikes in Japan, in North America would own cars or minivans. And they like their automobiles here, and certainly wouldn’t want to ride an e-bike when it rains, or in the winter, or when they need to bring their children to school, or soccer practice, or when they go to Wal Mart to stock up. In fact e-bikes have been available for years. Who uses them? People who don’t have the energy to bicycle, but can’t afford a car. When they first appeared on the streets they were a little disconcerting, some of them look like miniature scooters or scaled-down motorcycles, with vestigial pedals sticking out. The e-bike drivers don’t seem to understand the rules that apply to powered vehicles or to bicycles, but after a while you get used to that. New laws in California and New York are coming soon that may act as templates for many other states. Essentially these bills define e-bikes as bicycles if assist tops out at 20mph and 750 watts. New York City opposes the NY state bill. E-bikes seem like a flop in the Los Angeles area, though numbers vary with gas prices. There is absolutely no patrolling of inland bike paths, so the change is only a technicality other than along the beaches. Anyone know if the Copenhagen wheels are available yet. They sound interesting. They put out power as they feel you going uphill or expending effort or something. I think they even link to your personal device to display ride data. Sounds simple just installing the wheel on your bike and not having to buy a whole new ebike. My wife wants one as she is getting older and hills are tougher for her. But she’s not ready yet, she says! Having recently tried a decent e-bike for the first time, I was surprised by how much I enjoyed it. The cost and weight were the only unappealing aspects; the rest of the experience quite nice. I see a great use for e-bikes outside of the urban environment: for covering longer distances and hillier terrain than is comfortable for a non-Cyclist on an ordinary bike. As for redesigning urban cycling infrastructure for greater speed… Personally I am for slowing cities down to walking or human-powered cycling levels, and feel that making e-bikes the urban standard would be counterproductive to that goal. However, it seems counterproductive to slow down cyclists – which is what is happening in much of the U.S. now, with infrastructure that is unsafe at anything more than walking speed. From a traffic planning perspective, it would be ideal if we could slow down the cars and speed up the bikes, so they can use the same streets… E-bikes go a long way toward that. It’s a common mistake to only compare velocities when trying to decide if some modes of traffic should be separated into their own lanes or if they can share the same road. You have to look at the weight and direction as well, or as it’s called in physics: you compare the impulses “p”. Even if cars and bicycles run at the same speed, when they collide (and unfortunately they WILL collide sometimes) the cyclists will get hurt much more because his or her mass is so much smaller. In the Dutch approach to traffic safety (“Sustainable Safety”) this property is called Homogeneity: You can mix homogenous traffic participants whereas you separate inhomogenous ones. In this regard E-bikes with support up to 25 km/h are absolutely the same as any fit cyclist on a traditional bike. 25 km/h is not that much, and the weight still is much less than that of a car. Cycling infrastructure can cater to fit cyclists while still separating where Homogeneity requires it. E-bikes however will highlight bad cycling infrastructure – not because they are faster, but because they tend to be ridden by people less trained in handling bicycles at these speeds. So if you have cycle paths that are too narrow, for example, these cyclists will have more problems, but the paths were too narrow for “fit” cyclists as well. Make them wider! In Japan, the bad cycling infrastructure is sidewalk cycling, because it puts non-homogenous traffic on the same route (here: pedestrians and cyclists). Simply moving the (E-)cyclists on the road is not a good alternative from a traffic planner’s poing of view. tiny electric cars with electric drive offer weather protection. e-bikes offer all the negatives of bicycles without any of the intrinsic benefits. Using bike paths and other non-street routes to bypass gridlocked traffic and not having to search for a parking space are HUGE benefits that ebikes and bicycles possess which a tiny electric car does not. That’s also why ebikes have some advantage over motorcycles or electric scooters, as those are also forbidden on paths, sidewalks, and need normal-ish parking spaces. Ebike batteries can be removed for charging in the home, your tiny electric car will require an outdoor outlet and plug (and perhaps a reserved parking space?). Ebikes do not require an operator’s license, nor any license plate or road tax, unlike other motorized road-using vehicles. A bit of an off topic question: looking at the photos taken on your long rides, I was wondering why you don’t wear glasses to protect your eyes. Now, I don’t usually wear them on short urban/city rides, but on longer and faster country rides, I’m forced to wear some sort of plastic glasses to protect my eyes, otherwise having a flying insect impact with my eye at 20+ mph could be dangerous (causing at the minimum a diminished control and diminished situational awareness for some seconds). Where I live, during summer months you’d easily have such an occurence on a hour-ish ride, hence the need for me to wear glasses. RBA: You can’t ride that thing here. Randonneur: But it’s human powered. RBA: No, it’s also electric motor powered. Randonneur: But it’s still also human powered. RBA: Doesn’t matter. The vehicle must be solely powered by the rider. Randonneur: It is. I plugged it in, powered it up at my home, and I’m the one payin’ the electric bill! I recently purchased an electric bicycle as my second bike, which I now use daily for my commute, and for local errands. I love it. My commute home consists of a four-mile relentless hill-climb, which I would not be willing to do at the end of a long work day on a pedal bike, every day.. This e-bike makes it possible. It has all the benefits of a bicycle, (it’s fun) without the negative of a hard slog back home at the end of the day, and it’s a lot more enjoyable than driving a car. I think a lot depends on the electric bike – there’s a huge range, from mild-mannered pedal-assist to full-throttle. I wanted a beautiful utility bicycle that still feels and rides like a bicycle – pedal-assist, (no throttle), well-geared, and not too heavy (under 40 pounds). I chose the Faraday Porteur, and I’m very happy with it – I don’t need to use the pedal-assist except on the hill climbs, though it’s helpful at other times too – , it’s faster on the straights, but since there are no bike paths in my area, I feel a bit safer on the town and state roads having that extra boost when I need it.